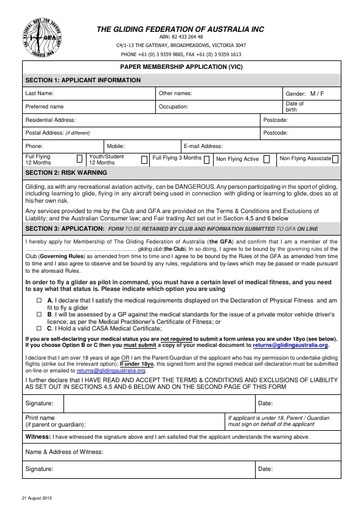 This form provides the appropriate form for memberships and medical declaration for members in NSW and WA who need to use them. Note that for all Adult members, the on-line options are quicker and easier to use. This form provides the appropriate form for memberships and medical declaration for members who need to use them. Junior members (under 18 years) will need to use these forms because the consent od a parent or guardian is required. This form provides the appropriate form for memberships and medical declaration for members in South Australia who need to use them. This form provides the appropriate form for memberships and medical declaration for members in Victoria who need to use them.